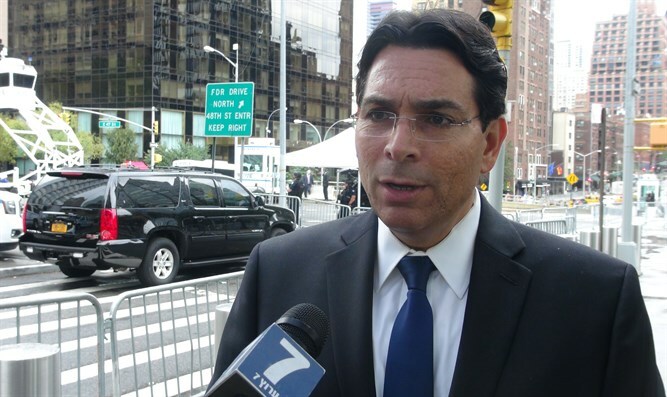 Israeli Ambassador to the UN Danny Danon praises US withholding $65 million from UNRWA. Israeli Ambassador to the UN Danny Danon praised the US decision to withhold $65 million in aid to the United Nations Relief and Works Agency (UNRWA) Tuesday. “UNRWA has proven time and again to be an agency that misuses the humanitarian aid of the international community and instead supports anti-Israel propaganda, perpetuates the plight of Palestinian refugees and encourages hate,” Ambassador Danon said. “Just over the last year alone, UNRWA officials were elected to the leadership of Hamas in the Gaza Strip, UNRWA schools denied the existence of Israel, and terror tunnels were dug under UNRWA facilities. It is time for this absurdity to end and for humanitarian funds to be directed towards their intended purpose - the welfare of refugees,” the Ambassador concluded. "There is a need to undertake a fundamental re-examination of UNRWA, both in the way it operates and the way it is funded," a State Department official said Tuesday. The move follows tweets by US President Donald Trump in which he questioned the wisdom of providing hundreds of millions of dollars in aid to the Palestinian Authority given their refusal to resume peace talks with Israel. The United States is the largest single donor to UNRWA, providing approximately a fourth of the organization's budget. Reports in Israel on Thursday indicated that the Israeli Foreign Ministry is opposed to Trump’s planned cut in the aid to UNRWA, fearing the possibility of resulting unrest, but Jewish Home chairman Naftali Bennett said this month that cutting aid to UNRWA is the correct move. For years, UNRWA has been a target for criticism in light of Hamas's activity in its educational institutions and the use of its facilities by Palestinian Arab terrorist organizations in Gaza. UNRWA was documented storing Hamas rockets and weapons "designed to kill Israeli citizens" in its schools, a fact which the UNRWA chief admitted himself. In addition, the organization has actively taken part in inciting anti-Semitic violence. It has perpetuated the status of Palestinian "refugees" for generations instead of working towards their absorption in host countries, continuing to call residents of camps located in the Palestinian Authority refugees. Audits have shown that the number of "refugees" in UNRWA lists is highly inflated.